RBTH presents a selection of views from leading Russian media on the latest developments in Ukraine, featuring analysis of the results of the second meeting in Minsk of the contact group tasked with regulating the peace agreement in Ukraine, a report on the potential consequences of a law adopted in Kiev on the purging of officials, and discussion of the situation surrounding the Peace March that took place in Moscow on Sept. 21. The Kommersant newspaper has published an article discussing the second meeting of the Minsk contact group for the regulation of the conflict in Ukraine’s eastern Donbass region. The plan agreed upon by Kiev and the leaders of the self-proclaimed republics of the southeast offers a real chance for the establishment of peace in Ukraine for the first time, writes the newspaper. "This is the main difference between the Minsk-2 Protocol and the former one," writes Kommersant. As the paper reports, the negotiations in Minsk focused exclusively on the conditions of the ceasefire, but the political futures of the Donetsk People’s Republic (or DNR) and the Lugansk People’s Republic (or LNR) were not discussed. Experts think that "achieving peace without settling the political issues will transfer the situation in the Donbass into the category of frozen conflicts, like the one in [the breakaway Moldovan region of] Transnistria. According to the paper, the new memorandum has not yet led to an actual truce: The shelling and clashes that have occurred after its signing are confirmation of this. "Thus, even the total ceasefire announced in Minsk, which was to be effective immediately, still remains only on paper," states Kommersant summing up the situation. "According to the law on purging, questions may even arise concerning Petro Poroshenko," writes Nezavisimaya Gazeta. The publication informs readers that according to a law adopted in Ukraine, those who held senior positions in Ukraine's governmental and other state structures between 2010 and 2014 would be eligible to be purged. "In fact, President Petro Poroshenko held a number of senior positions in the government during this time," writes Nezavisimaya Gazeta. The newspaper also reports that those officials who contributed to the persecution of participants on Kiev’s Maidan square and those who called for separatism, as well as former KGB workers and leaders of Party and Komsomol structures during the Soviet period must also be purged by court decisions. The publication stresses that when the law was adopted, deputies were acting "under heavy pressure from the streets: Rallies were held for several days at the time of the readings at the Verkhovna Rada building. Experts note that purging became one of the first and main demands of the Maidan: They named the reason for the uprising in the fall of 2013 not the authorities' decision to defer European integration but the fact that "the hope for purification of the power structure in the process of European integration had been taken from the people." "If only there had been no war" – this is the headline of a Gazeta.ru article discussing the Peace March which took place in Moscow on Sunday, Sept. 21. The publication writes that, like the first peace march that occurred in March of this year, the Sunday procession was "accompanied by an apocalyptic background," and the publication discusses the fact that the in the run-up to the march, the event was "either being on the verge of cancelation or having already been canceled." In the opinion of Gazeta.ru, the situation was inflamed by rumors that "Russia's disconnection from the global internet was about to be discussed” at a meeting of the Security Council of Russia, and that “foreign companies would be banned from owning Russian media, and that they expected provocations at the march itself." The authors of the article emphasize that the opposition leaders reported about 100,000 dissenters while the "police reported three or five thousand." The truth, according to the publication, is somewhere in the middle. 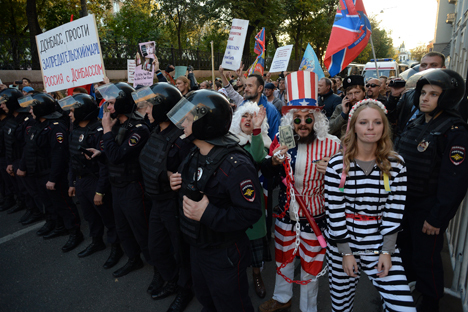 Most of the slogans were not so much anti-war as directed against the Russian authorities," notes Gazeta.ru.